Pizza may go hand in hand with Italian cuisine, but its origins can be traced back to the Ancient Greeks, where a yeast-less flat bread was baked with veggie toppings. Slowly but surely, it found its way to Naples in Italy and those less fortunate started adding tomato to the flat bread in the late 18th century, creating the first versions of what we now call pizza. Remember the scene from Eat Pray Love with Julia Roberts’ pizza frenzy? Well that’s Da Michele pizzeria in Napoli. 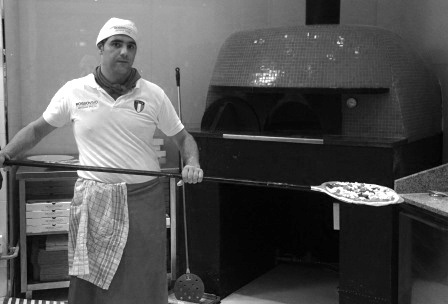 Even though FooDiva has blogged about Dubai’s best pizza before, finding authentic Napoli pizza here amongst the zillions of Italian trattorias and pizzerias is like searching for a needle in a haystack – but looks like the opening of a teeny pizza joint, Rossovivo at Business Bay may help fill that gap. The owners may be Romans, but the traditional wood-fired oven was constructed by a builder from Naples using hand-made clay bricks imported from Campania. 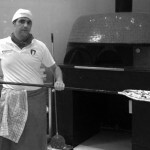 Most importantly though, the pizza chef, Raffaele hails from Naples and even worked at Da Michele. The hot air rolls over the top of the pizza, whilst the bricks seal the base immediately to make it firm and crispy. Free of artificial additives and preservatives, the dough is leavened for 24 hours which also helps makes it light, fluffy and crispy. The problem with this is that the chef will stay for the first month, then they’ll hire cheap labor to replace him, the quality will suffer and the place will eventually close. Until of course another place opens up and yet another chef flies over from Italy expecting to find the golden land of wonder that is Dubai to foreign eyes.